I think I neglected to mention here that my Etsy shop will be taking a summer vacation. My sewing machine desperately needs a tune-up and I'm looking forward to spending time with my family, including my husband, Chris, who is finishing up a 2 1/2 month gig at the Old Globe Theatres in San Diego. I'll reopen my shop in July with a (hopefully) re-energized machine and brain. One thing I'm doing during my hiatus is my on-going quest to tidy my work space. I've seen so many inspiring studios on other blogs, including Jenn Maruska's recent studio updates, that I've been anxious to get mine in order. And yesterday, I got a terrific book, "Creating Your Perfect Quilting Space" by Lois Hallock from the library. I wish I'd had the forethought to take a "Before" picture, but just imagine ugly stacks of random paper and unused hanging files and you'll have it. 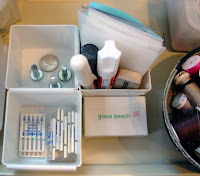 The beauty of this drawer is that it pulls out, making it so efficient to get stuff and then stow away. I love this little area with my snap whackers (I use a quarter for an anvil since I think my original anvil ended up in a wristlet I sent to Michigan), wallet innards, marking tools, extra machine needles and my glassbeach labels by RohmCustom. On the right is a lovely bowl made of wire from Africa that my dear mother-in-law gave me years ago. I'm seriously crushing over my new drawer. I'm very pleased with the improvements I've made in my studio so far. I haven't made anything prettier, yet, but I've made some things tidier! ps. I posted the first pic on flickr with some more notes. I am so jealous- I wish I could get just a small corner of my studio, no wait my office, wait my house- hell, my life organized!!! Oh it looks so great! I did a big clean-up a month or so ago and it is an absolute disaster again. 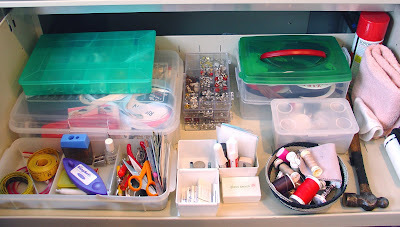 That looks super organized - and with everything at your fingertips... heaven! did you wake up and skip to go look it again... i bet! looks great :) It'll be nice for you to see it clean while you take a break. Oh my...I wish that I could get my work space so neat and tidy. Then keeping it that way would be a whole other challenge!! LAUGH OUT LOUD! My husband didn't miss you, i did... i forgot to sign out of his blog, and didn't look at it after i published. you were probably like... "ahhh...!?" and husband was like, "Hunny?!" Hee, that's what I thought happened!